#CrabOfTheDay showcases a different crab or crab-related arthropod every day, with pictures, taxonomic info, geographic distribution, and a bit of useless science-y trivia. Soon there will be both a cast-resin figure and a coffee table book to accompany the fun, and as there has always been a fun little connection between the Glyoverse and 'crab' I thought I'd let y'all know! If you would like to be included in the crabbening, send a facebook friend request to adam.hadsall.3 and/or follow @_Nezumiiro_ on twitter. Ether or, CRINCH! you there! Additionally, I'll be reposting them here! Any requests for specific species, old archived favorites, or suggestions- I'd love to hear 'em! CRINCH! ‪#‎CrabOfTheDay‬ for 10/21/2015: Pitho aculeata or the Massive Urn Crab is as its name suggests, one of the larger members of the “Urn Crab” family or Epialtidae, subfamily Tychidae. Like many of its ilk, Massive Urns are native to the Western Atlantic, primarily the Keys, the Bahamas, Cuba, the Antilles, and the Caribbean. These crabs feed along the rocky sea bottom and scurry for the undersides of shells and other protective rubble when chased by the many bonefish that love to eat them. P. aculeata crabs are teardrop-shaped, with their eyes at the narrow-most end of the teardrop. Males have bigger, spikier chelipeds (claws) than females. CRINCH! 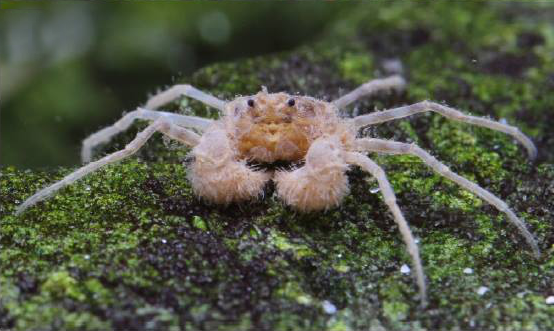 ‪#‎CrabOfTheDay‬ for 10/22/2015: Kiwa tyleri or the “Hoff Crab” (Indeed named for the hirsute David Hasselhoff) is a “Yeti Crab” living near Antarctic thermal vents. Like its namesake, the ‘Hoff has a noticeably hairy ‘chest,’ in which it collects thermophilic bacteria living in the vents, and actually farms these little organisms as its primary foodsource. Being that Hoff crabs have very distinct temperature needs, they will cluster in huge piles around the ‘temperature envelopes’ each vent creates. The liquid that flows out of these vents is super hot: up to 700F! Step too close, and you quickly becomes an over-cooked crab cake, step just a little too far from the vent, the inhospitable Antarctic water will freeze you instantly. 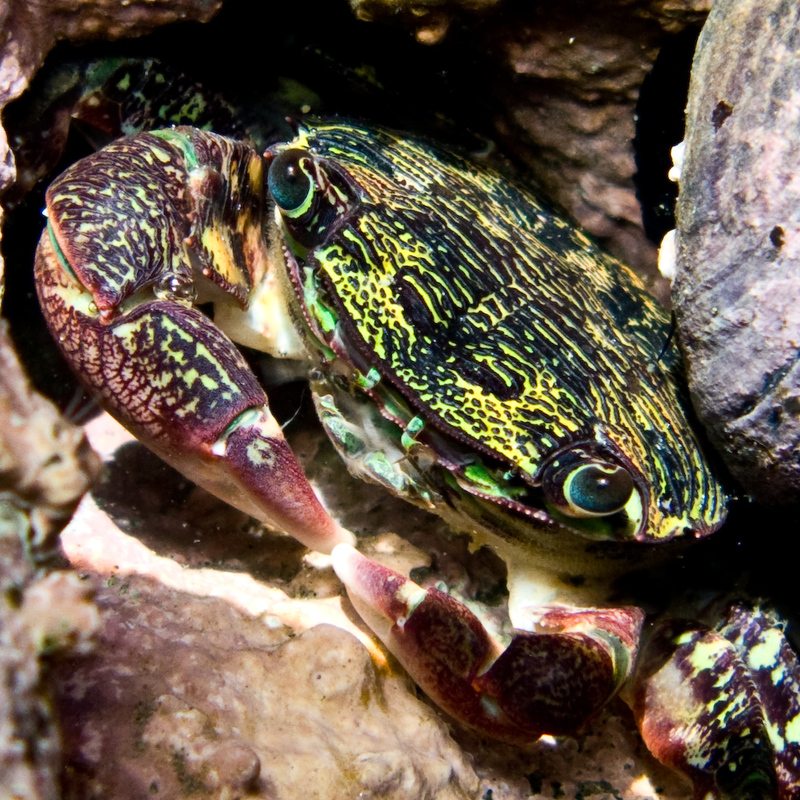 Male crabs, larger than the females, can never leave the vent at which they are born. Females, however, are a little bit tougher and can make the journey when necessary, to find a new vent at which to lay eggs. CRINCH! ‪#‎CrabOfTheDay‬ for 10/23/2015: The Saber Crab (Platychirograpsus spectabilis) is a Glyptograpsidae crab species endemic to Eastern Mexico and the Gulf of Mexico through the North Atlantic Ocean. As its AWESOME name implies, the left chela (claw) in males is not only exaggerated in length on males, it also has a “guard” like an actual saber! CRINCH! 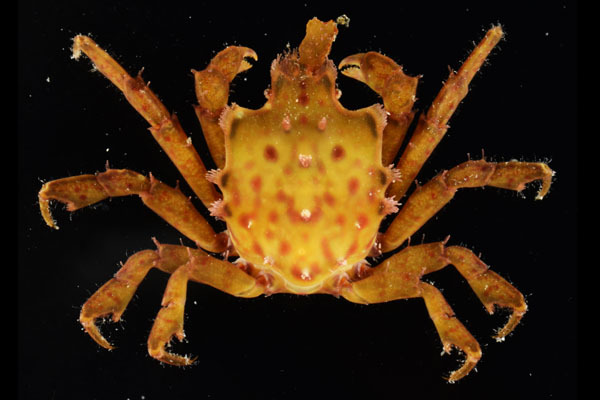 ‪#‎CrabOfTheDay‬ for 10/24/2015: The Jackknife Spider Crab or Acanthonyx petiverii is an extant member of the genus of Epialtidae. 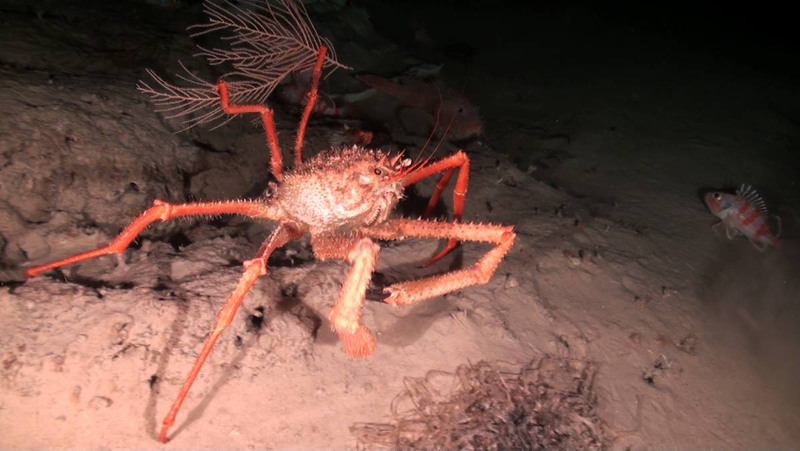 This minute beastie belongs to a family of spider crabs closer genetically, to decorator crabs than the larger, more prominent pacific spiders. (Like the King, and Japanese Spider.) Hanging out mainly in warm-water reefs with other similar-sized crabs, Jackknives range from the Western Atlantic, Galapagos Islands, Gulf of California, Panama, Chile, Mexico, and Ecuador. CRINCH! ‪#‎CrabOfTheDay‬ for 10/25/2015: Palaemonetes pugio or The Daggerblade Grass Shrimp is, you guessed it, not actually a crab! This small, fragile-looking shrimp is smoothly transparent with the exception of two pairs of well-developed dorsal spines and also two pairs of posterior spines adorning its body. These spines really don’t do much to protect it against the fish that hunt and eat these little guys, but man do they look cool! As its name suggests, Daggerblade Grass Shrimp live in shallow coastal and estuarine seagrass beds and oyster reefs (duh!) in the Western Atlantic and Gulf of Mexico, occurring from Canada to Texas. Awesomely enough, Palamonetes shrimp are among the most abundant and widely distributed benthic macroinvertebrates in the Atlantic! CRINCH! ‪#‎CrabOfTheDay‬ for 10/26/2015: The Spiny Lithode Crab (Acantholithodes hispidus) inhabits rocky reef systems in the Pacific North West. It can be distinguished by the white molar-like teeth on the grasping edges of its red claws and a flattened, pear-shaped body covered with numerous spines. The largest of these spines occur along the carapace margins, with smaller ‘needles’ distributed dorsally. 'Acantho' means "spiny" and 'hispid' means "hairy". So, uh… Spiny-Hairy! Spiny Lithodes inhabit rocky or muddy areas where easy-to-catch shrimp thrive. 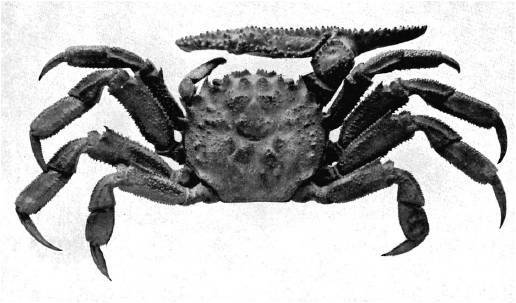 Additionally, this crab is a hunter of opportunity; it will attempt to pull apart and eat shrimp already caught in fishing traps whenever possible. Smart Crab, unless of course it gets stuck in those traps! A. hispidus ranges from Monterey, California to Alaska, British Columbia, and the Strait of Georgia and Bering Sea. Just wanted to chime in and say CRINCH! This project is great! Would love to support it any way I can. Keep up the great work, Nez! Thanks a ton! Just keep following! If you want double the CRINCH! follow me on facebook and and/or twitter! CRINCH! ‪#‎CrabOfTheDay‬ for 10/27/2015: Epialtus dilatatus, aka The Winged Mime Crab is a rarely-seen Western Atlantic species from the genus Epialtus and the Epialtinae subfamily of crabs, identifiable by the protruding ‘wings’ occurring along the lateral edges of its carapace. The EXACT purpose for these ‘wings’ is not truly 100% understood, but it’s proposed that these structures aide the crab during mating, or providing additional protection from specific predators. Either or, weird! Winged Mimes hang out on the hard bottom (rock, rubble, and coarse coral sand) stretches along more shallow and less turbulent runs of coast. CRINCH! ‪#‎CrabOfTheDay‬ for 10/28/2015: The Thumbnail Crab (Thia scutellata) is a relatively small species of Thiid crab that occurs in the North Sea, north-east Atlantic and the Mediterranean Sea, with major populations present along the south-western warmer water along the Dutch and German coasts. 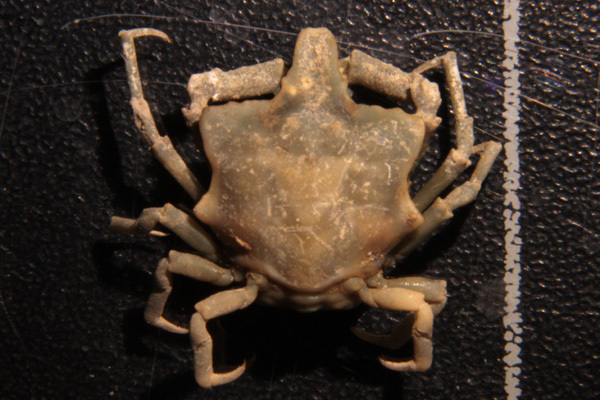 Though there are two fossil relatives, Thumbnail crabs are the only LIVING member of the genus Thia. T. scutellata lives most of its life burrowed in the sand. The carapace of these crabs is surrounded by a rim of “hair” which allows it to filter food particles from the sand it lives in. Unsurprisingly, T. scutellata gets its common name due to its carapace resembling a human thumbnail. CRINCH! ‪#‎CrabOfTheDay‬ for 10/29/2015: Thoe puella or the Scarlet Mime Crab (another Mime already?) is one of the few species included in the genus Thoe and family Mithracidae. Interestingly enough, “Thoe” is a sister genus to the more newly established genus “Petramithrax,” giving the genus a clearer taxonomic bridge to the Mithrax crabs they developed from. 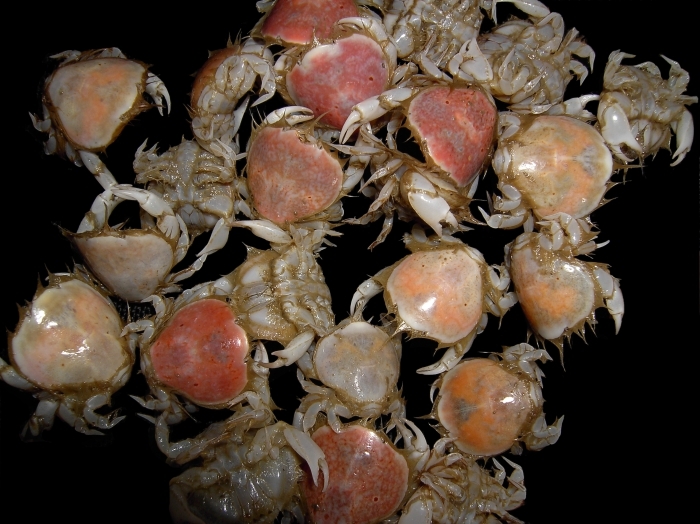 Hailing from Atlantic shelf-reefs where corals resembling the surface these crabs carapace are in abundance; the small-ish crabs feed on zooplankton and detritus via some highly specialized ‘feathered’ mouthparts. Like allllll members of Thoe, the Scarlet Mime’s body is overall pear-shaped; their oblong body is roughly longer than it is wide. CRINCH! 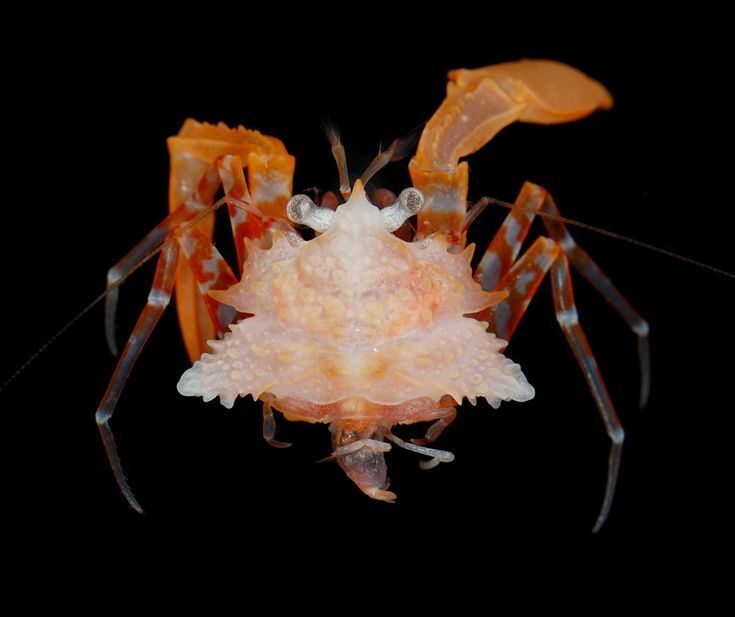 ‪#‎CrabOfTheDay‬ for 10/30/2015: Austinixa chacei or the Chace Pea Crab is a species of Malacostraca crab, first described during the 1955 Wass study. A little-studied member of family Pinnotheridae, Austinixa chacei, like its cousins formerly fell into the genus Pinnixa. 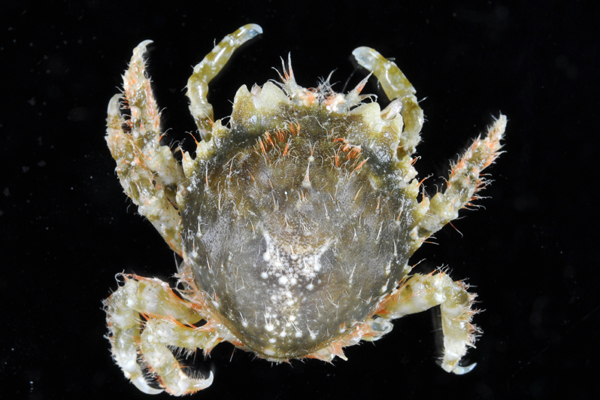 Living commensally in the soft-tissue margins of conquina clams, Chace Pea crabs can be found primarily in the Gulf of Mexico. …Patagurus rex or the “Pat McLaughlin” Hermit Crab! This denizen of the deep is a pagurid French Polynesian (Moorea, Society Islands) Hermit Crab that is so terrifying that it REJECTS the idea of using a shell! Though this crab’s distant ancestry most likely used snail shells to protect their bodies like normal hermits, Pat-Rexes de-volved, thickened their own carapaces, and quit using shells. This non-linear development track is a beautiful reminder that evolution isn’t always a sensible direct line of adaptation from one mode of living to another. The result is a really neat looking hermit crab that probably moves in a very unique fashion now that it doesn’t have a heavy snail shell anymore. So strange is this development, these crabs were given an entirely new genus, named after one of the world’s most eminent carcinologists, the late Dr. Patsy (Pat) A. McLaughlin (1932–2011). …Our final ghoulish grasper has a pure black heart, and even blacker claws! It’s the Black-Fingered Mud Crab, or Panopeus herbstii. Like its creepy name implies, Black-Fingered Mud Crabs are dark brown in color, with stout, black-tipped and unequally-sized with knobby teeth on the closing edge. P. herbstii prefers the brackish depths found in Atlantic oyster reefs and muddy bottomed marshes- LIKE THE BLACK LAGOON! Black-Fingered Mud Crabs are straight-up KILLERS! They use their strong claws to crack the shells of oysters, barnacles and marsh periwinkles, and can also be found feeding on worms, fish and even other crabs. THE HORROR! CRINCH! ‪#‎CrabOfTheDay‬ for 11/02/2015: After a 1-day break from the crabsplosion that was Halloween, ♫ “Ice is back with a brand new crustacean.” ♫ The Atlantic Sea-Spider Crab or Maja brachydactyla, differentiated from the Common Atlantic Spider Crab, Maja squinado after much taxonomic confusion. Maja brachydactyla is a species of migratory crab found in the north-east Atlantic, South Europe, and the Mediterranean Sea. As far as Brachyuran crabs go, Atlantic Sea-Spiders have a high economic and ecological significance, supporting fisheries along the NE Atlantic coasts (Spain, Portugal, France, Ireland and UK). The high fishing pressure tolerated by populations of this crab (ie, a LOT of ‘em can be caught without adversely affecting wild populations) together with their growth and reproductive characteristics make M. brachydactyla a great substitute for less economically viable crab industries in these areas. CRINCH! 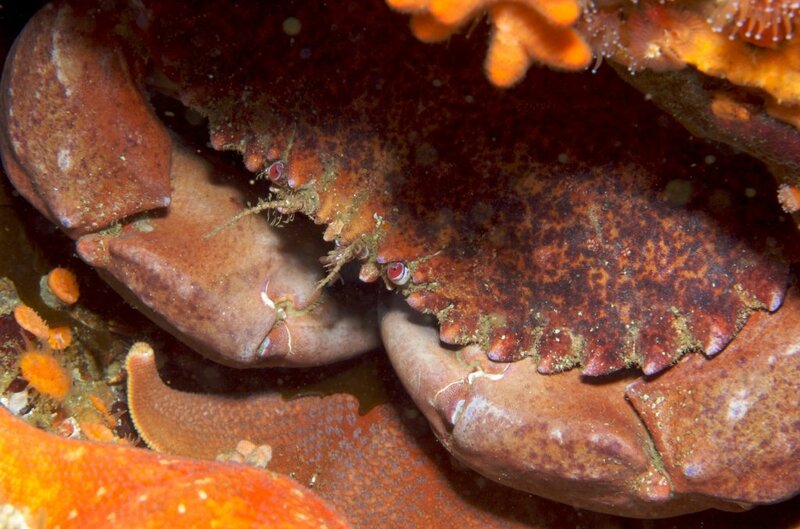 ‪#‎CrabOfTheDay‬ for 11/03/2015: Romaleon antennarium, known as the Brown, California, or most often, Pacific Rock Crab. 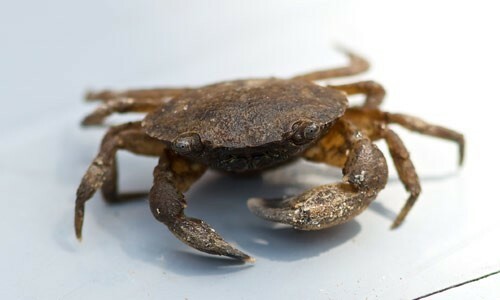 This well known crab is obviously routinely found on the western coast of North America. Pacific Rockies have gone through a bit of taxonomic confusion in their time: though R. antennarium is MOST correct, “Romaleon antennarium,” “Romaleon antennarius,” “Cancer antennarium,” and “Cancer antennarius,” are all synonymous terms. 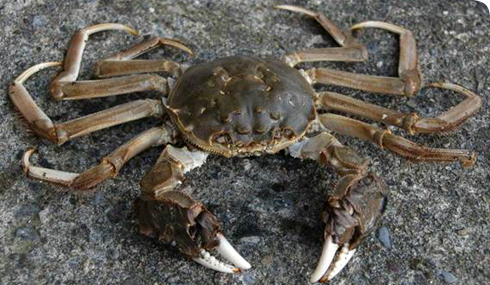 Additionally, Pacific Rock Crabs, Yellow Rock Crabs (C. anthonyi), and Red Rock Crabs (C. productus) are all common fishery crabs, accounting for an average of 1.2 million pounds per year from 1991-1999. CRINCH! ‪#‎CrabOfTheDay‬ for 11/04/2015: Pachygrapsus crassipes or the Striped Shore Crab. How have I not posted this amazing beastie yet? This small crab can typically be found on just about ANY Pacific rocky or hard-mud shore, from North and Central America across to Korea and Japan. A highly adaptable crustacean, (borderline invasive!) P. crassipes can survive a variety of temperatures and will eat any vegetation, creature, or detritus it finds. This crab has some AMAZING colors and marking patterns; it’s carapace will be striped or mottled with combinations of green, brown, and purple. CRINCH! ‪#‎CrabOfTheDay‬ for 11/05/2015: Portunus xantusii or the Xantus Swimming Crab. 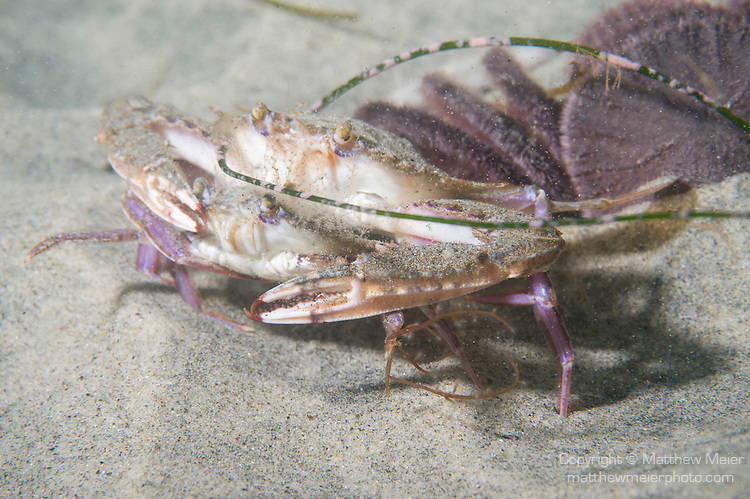 This beautifully purple-detailed crab is a swimming crab, common near sandy and muddy areas to up to the 150 foot depth in Central California, Baja, and through to the Sea of Cortez. This crab can usually be found partially or fully buried in sand; swimming up to the surface for infrequent hunting excursions. This Now the most common intertidal and shallow water portunid in sandy bottoms of estuaries and protected bays of Baja California, Xantusses have shown an incredible population bounce-back since these protections have been put into place. The sight of one of these awesome crabs peeking out in a healthy bed of sand-dollars is one of those amazing underwater experiences that California divers frequently stumble upon. P. xantusii crabs actually engage in precopulatory courtship rituals. (through olfactory and tactile cues) Though indirect sperm transfer is the actual mechanism for mating, these crabs foreplay it up bigtime! SIDENOTE: a ton of the pics I browsed through for these guys showed crabs makin’ sweet, SWEET love. CRINCH! 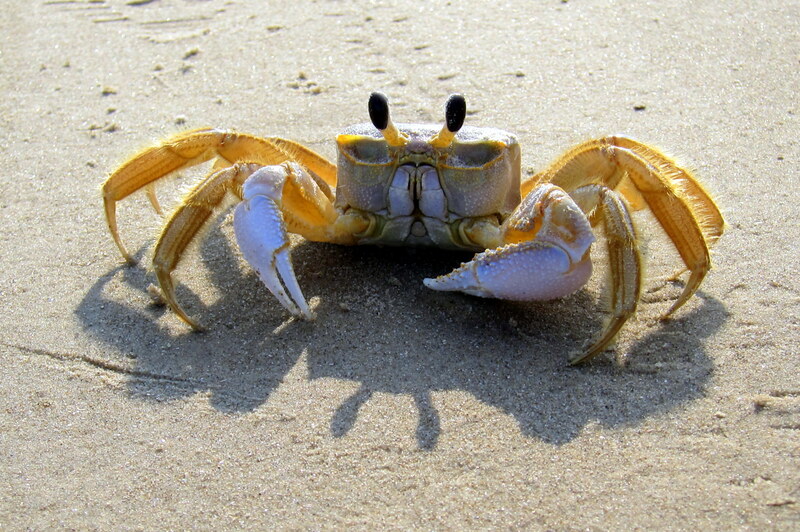 ‪#‎CrabOfTheDay‬ for 11/07/2015: The Golden Ghost Crab or Ocypode convexa is a species of ghost crab living predominantly in Western Australia. Named for their bright yellow carapace, these little guys scuttle along the beach looking for meals of dead animals and plants which have washed ashore. These nocturnal and semi-terrestrial little guys have a square-shaped and robust body, with strong running and digging legs, asymmetrically sized claws, and the pointy eyestalks common with Ghost Crabs in general. There is a record from 1962 where Ride Magazine (a surfing publication) reported from Bernier Island that adult O. convexa were foraging over half a kilometer inland following heavy rain. Though these little golden guys don’t pose a huge threat to humans, they can leave ya’ with quite a CRINCH! CRINCH! ‪#‎CrabOfTheDay‬ for 11/08/2015: Hyas coarctatus or the Arctic Lyre Crab has a ‘lyre-shaped’ carapace, and long, spindly legs. These brownish red, dirty-looking crabs are found at hard, stony, sandy and soft bottomed depths, ranging from 1–500 meters, though most often above 50 meters. H. coarctatus is widely distributed in the North-East Atlantic and adjacent seas, the northern border around the North and West Splitsbergen and Barents Sea, clear through to the North-East coast of France, and the Western Baltic Sea, the Belt Sea and the Sound of Denmark. A scavenge-predator by nature, H. coarctatus is a grazer on algae, and a predator on hydroids, annelids, crustaceans, mollusks, small fishes and shrimp. Smaller Arctic Lyres act a lot like decorator crabs; they attach bits of algae or debris to the setae of the rostrum, carapace proper and walking legs. Though the decorator crab habit peters off in old age, the carapace of adult individuals may be encrusted with barnacles, tube-building worms, and bryozoans. Fun fact: Some biologists recognize COMPLETELY separate subspecies of Arctic Lyre Crabs, though this is as yet unconfirmed by genetic survey. CRINCH! 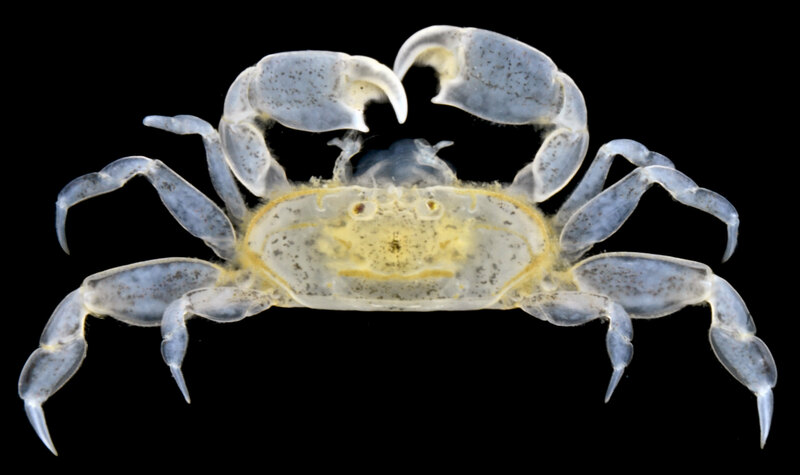 ‪#‎CrabOfTheDay‬ for 11/09/2015: Aletheiana tenella, in the interim, known as the Sulawesi Freshwater Crab is a fairly newly catalogued species AND genus of freshwater hymenosomatid crab from Central Sulawesi, Indonesia. Odly enough, this hairy discovery differs from the other known Sulawesi hymenosomatid species (Cancrocaeca xenomorpha, Sulaplax ensifer) in that it lives among the submerged fibrous roots of trees at the slow flowing parts of riverbanks rather than primarily in cave habitats. “Aletheia” is an ancient-Greek word for disclosure and a state of not being hidden. The latinised name “tenellus” means delicate; alluding to the small size and slender appendages of the species. 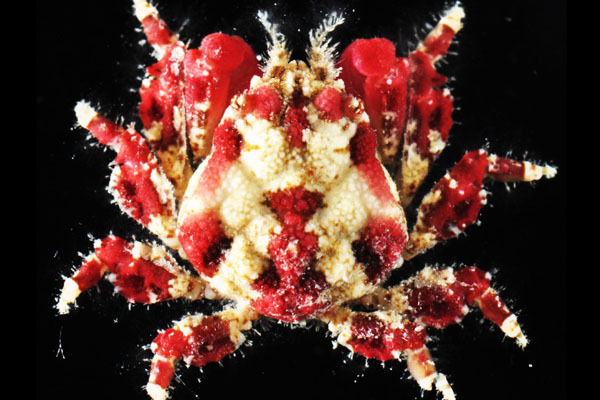 The Spider Decorator Crab is nocturnal scavenging and hunting throughout the tropical waters of the Indo-West Pacific area, including the Red Sea. Though slightly destructive to smaller coral populations; in an interesting twist, some corals have adapted to be propagated in this manner. CRINCH! The BONUS #CrabOfTheDay‬ for 11/10/2015: Karkinos! Believe it or not, there was a badass mythological crab that has had some long term impact on how we identify a certain portion of the cosmos! According to the Greeks, during one of his labors, Hercules and his cousin Iolaus had to battle the Lernaean Hydra. (A monster with the body of a snake and nine flipping heads!) In order to tip the scales in her snake-monster’s favor, Hera (Zeus’s wife, and a really vengeful piece of work) sent Karkinos, a GIANT crab monster to attempt to distract Hercules and thus give the Hydra the upper hand. During the battle, Karkinos gets his moment in the sun when he pinches the crap outta Hercules’s toe! The son of Zeus wasn’t having it however, and one swift stomp from Hercules horribly cracked the shell and killed Karkinos. Karkinos, in the throes of death refused to let go, and though Heracles eventually defeats the hydra, Hera is so impressed with the tenacity of the crab that she exalts it into the heavens as the Zodiac Sign Cancer. While we astrologers see the sign of Cancer as nurturing and sensitive, we should also remember this mythic tenacity of the crab to “hang in there.” Cancers are great protectors and defenders, and if riled, can be formidable opponents. Nevertheless, prepare to be interested/horrified! “Remipedes,” (no relation to centipedes) are creepy little primitive crustaceans that develop in some really distinct biomes such as coastal aquifers which contain mostly saline groundwater. These fully-blind beasties have changed little throughout their existence; fossil versions of at least seventeen living species of Remipede have been identified with global distribution throughout the neo-tropical zone. Remipedes are 10–40 millimetres (0.4–1.6 in) long and are basically built from a large hungry head, long segmented body (10 – 40 segments!) with a bunch of crawly/swimmy flipper appendages. Speleonectes tulumensis is particularly scary in that it is to date, the ONLY venomous crustacean on Earth! These guys have MASSIVE fangs connected to secretory glands, which inject a combination of digestive enzymes, paralyzing agents, and septic/caustic venom into their prey. GROSS!